Don't just stand around all day. Sit down. 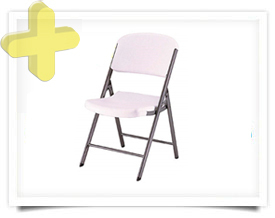 Cypress Party Rentals has plenty of chairs that you can rest on while you take a break from your event to eat a snack, socialize, or watch the frenzy going on around you. What is the popcorn machine going to rest on? What will the presents rest on for your angel's Birthday Party? 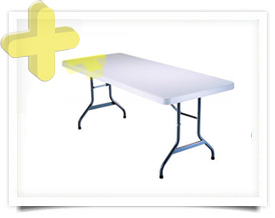 Cypress Party Rentals has plenty of tables for your party. These tables are sanitized after each use to help compliment a clean environment for your guests. Don't forget your tablecloths!! Any ideas on staying cool for the Summer? Cypress Party Rental Sno Cones come with a variety of flavors (e.g. Cherry, Raspberry, Strawberry). 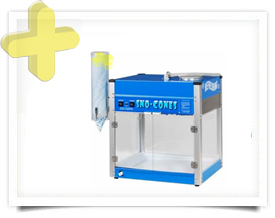 We supply the Sno Cone flavor, cups and machine. We do not deliver ice. Does that sound like a fair deal? The only thing as fun as eating the Sno Cones are making them. Enjoy! Let us know how many guests your planning for. We have plenty of FRESH supplies. When is warm buttery Popcorn not invited to the party? 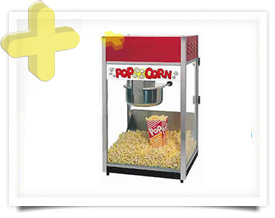 Never put a Popcorn Machine to use? We'll quickly show you how to use it and supply you with popcorn bags and a convenient scooper to serve with. You cannot go wrong no matter the type of event you are planning. We highly recommend not skipping out on extra supplies for those interested in an outdoor theater set-up. Notice: Not for infants. Popcorn is a potential Choking Hazard for all ages.